Here’s something I do more often than I’d like to admit, and I’ll bet plenty of other photographers do it, too. The problem comes the next day when I forget to change the ISO back to a low value. I photograph something in the daylight, and end up with images that have plenty of exposure—plus a solid dusting of digital snow. Reducing that noise using software later isn’t as easy as applying a filter, but the Noiseless and Noiseless Pro ( ) applications for OS X from MacPhun come pretty close. Although eliminating noise seems to be the goal, we actually need to replace the existing artifacts with areas of pixels that aren’t as noisy. For smooth surfaces, that means melding the noisy pixels into a uniform color. 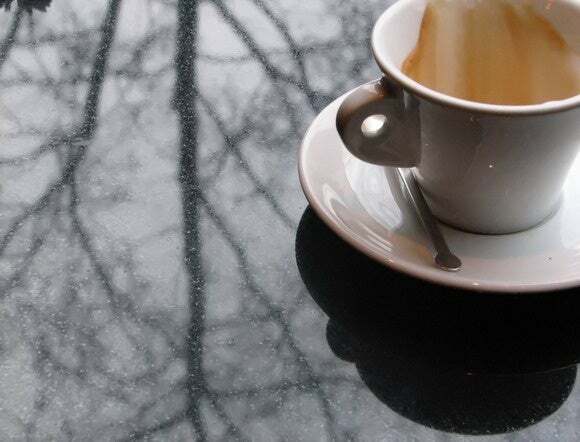 But photos aren’t often comprised solely of smooth surfaces. When you simplify complicated areas using the same approach, you lose detail and end up with an image that looks more like an Impressionist painting. Noiseless (and other tools, such as those built in to image editing applications) uses algorithms to adjust the appearance of the pixels in a way that minimizes the original noise and retains detail. When you open a photo in Noiseless, the app applies a preset based on information it finds in the image’s EXIF data. (If a file contains no EXIF data, no preset is chosen, which at first made me think the automatic feature wasn’t working.) The presets are about as friendly as you can get, starting with Lightest and incrementing to Extreme, and tackle both luminance noise (the strength of light) and color noise. 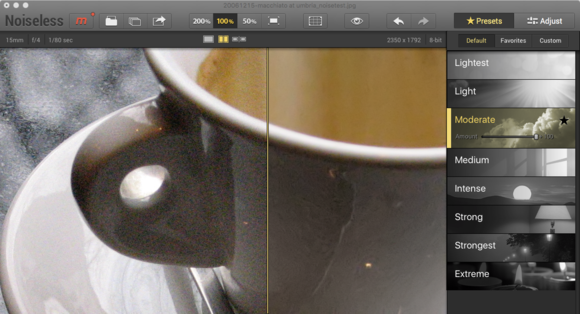 Clicking one applies the effect in a before-and-after preview that’s zoomed-in so you can view the details. A Noiseless preset fixes an old photo that contains a lot of luminance and color noise. Drag the divider to reveal more or less of the corrected After version. If you drag the image to view another area of it, the app needs to re-render the preview, but since Noiseless is calculating just the visible area, the previews are speedy enough. You can also work with just the preview, or the original and preview side-by-side. As is the case with many image-editing applications, I expected that the presets were just starting points, and that I’d be doing the “real work” using the controls in the Adjust panel. But often the presets were all I needed. If an effect seems to push too far, dragging the Amount slider within the preset button pulls it back (by changing the effect’s opacity). Here is the original image (top) and the version processed using only the Intense preset (bottom). Click to enlarge. When you do want to dig into the manual controls, the Adjust panel includes sliders for manipulating the amount of color, luminance, and smoothing (which targets noise patterns on large surface areas). That’s also where you’ll find Structure and Filter controls for adding definition to images and mitigating the softening effects of noise reduction. When working on images that include people, for example, too much smoothing can make them appear plastic. I found that adjusting the opacity slightly often did wonders to offset the effect. Noiseless also adds an editing extension within the Photos application under OS X El Capitan, allowing you to reduce noise in images without having to first export them from your Photos library. Noiseless Pro, available as a separate application or as a paid update from within the Noiseless app, adds the ability to process raw images (Noiseless by itself supports only JPEG, PNG, and TIFF files), and includes plug-ins for Adobe Photoshop CC, Lightroom, Photoshop Elements versions 10 through 12, and Aperture. It also adds a Details control for teasing out more definition in images, RAW Processing controls for making basic exposure and color temperature adjustments in raw images, and it supports sRGB, ProPhoto, and Adobe RGB color spaces. Comparing a detail of Noiseless Pro versus Lightroom CC processing. Click to enlarge. Noiseless Pro also includes a batch feature for processing multiple files at once (using settings you choose or letting the software pick based on its analysis of each image). Batch can also be added to the regular Noiseless application for a separate upgrade fee. Noiseless Pro’s ability to work on raw files produced mixed results for me. 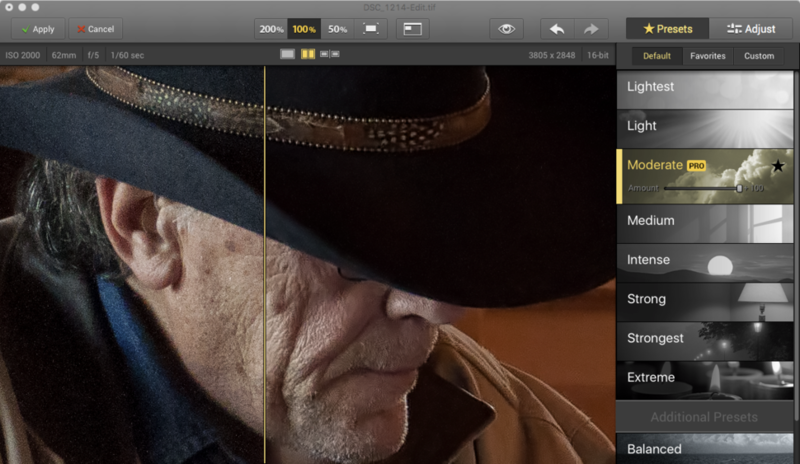 One advantage of editing raw images is that the raw formats incorporate some noise reduction in the algorithms, and Noiseless Pro appears to take advantage of those. However, when I opened and edited the raw file of a noisy, underexposed shot, Noiseless Pro did a fine job of removing noise but muddied the tones overall. The basic raw processing controls for handling exposure are limited compared to what’s found in Lightroom or Photoshop CC, resulting in heavy-handed tonal adjustments. In the Adjust panel, I left those controls alone and focused just on the noise reduction options, then exported the image as a 16-bit TIFF file to work on exposure in Lightroom. The result was uneven. Going the other way was an improvement: I adjusted the tones in Lightroom first, then used the Noiseless Pro plug-in to create a 16-bit TIFF file that was sent to the Noiseless Pro application for cleaning the noise. Noiseless Pro versus Lightroom CC processing, full images. Click to enlarge. Working on an adjusted TIFF image yields better results; note the lack of noise in the hat but the retained detail in the man’s face. Dealing with digital noise is something that all photographers run into at some point, regardless of the type of camera. Noiseless Pro stumbles when working directly on raw images due to its emphasis on noise reduction versus overall tonal adjustments, but in other areas both Noiseless and Noiseless Pro performed admirably to clear up digital snow flurries.